Dave and Anna, two environmentalists from the United Kingdom, started their “biking for rewilding” tour in April 2015 after leaving their office jobs and taking off on an adventure with a purpose. In this fourth blog you can read about their visit to the European bison project in the Kraansvlak area along the Dutch coast. This project is one of the first members of the European Rewilding Network (ERN). It was here, where Dave and Anna met the spectacular European bison in nature for the first time in their life. European bison (Bison Bonasus), in a fenced reserve in National Park Zuid-Kennemerland, Kraansvlak, The Netherlands. On our cycle tour along European rewilding areas, we had to get from the Swiss National Park to the Dutch coast in two weeks time, which was difficult to do by bicycle! However, we cycled from Switzerland into Germany over a few passes and followed the river Rhine around Lake Constance. When we arrived to the Black Forest in Germany, we spent a few days there enjoying the glorious summer weather and the landscape before getting on the train to the Netherlands. 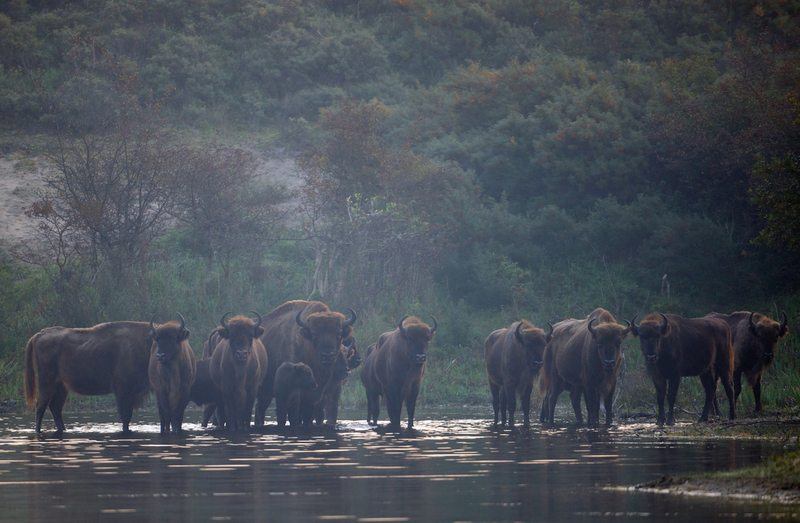 This visit was going to be an exciting one for us – some Dutch had managed to get a bison herd roaming the Dutch dunes! This country is densely populated, just like our home country the UK, and we wanted to see how rewilding can be done there and what it would look like. In addition, we were excited to see the place where Yvonne Kemp is based. Yvonne is the Coordinator of the European Rewilding Network and also the Coordinator of the bison project. Yvonne has been instrumental in making our trip happen and we were excited to get to finally meet her and thank her in person! 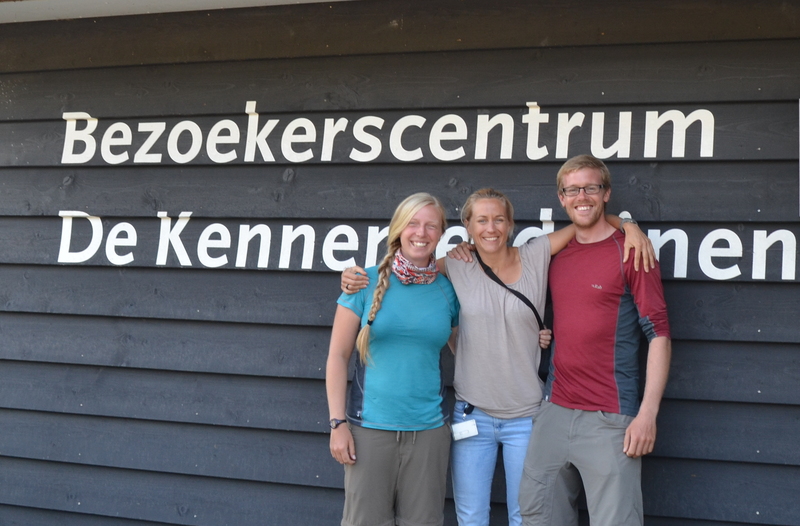 Anna and Dave with Yvonne Kemp (center), Coordinator of the European Rewilding Network (ERN) at the visitor centre of the National Park Zuid-Kennemerland, The Netherlands. We cycled to the visitor centre of National Park Zuid-Kennemerland in the morning to meet Yvonne and the team. Yvonne welcomed us enthusiastically – she talks quickly and excitedly and smiles a lot. We really enjoyed chatting, catching up and filling in all the information about Rewilding Europe and the European Rewilding Network. We got an introduction about the area as we headed out the door for a tour of the “ Kraansvlak” – a closed section of the National Park Zuid-Kennemerland where the bison herd lives. The National Park is owned by the municipal government but is managed by a variety of organisations. The local company called ‘PWN Water Company North-Holland’ manages the biggest part of the area. This company uses the area for drinking water storage through infiltration in the sandy dunes, which fits very well with nature management. In many countries, it is unusual for a private company to run (part of) a National Park, but PWN has a Nature Department, receiving 3% of the company’s annual budget. 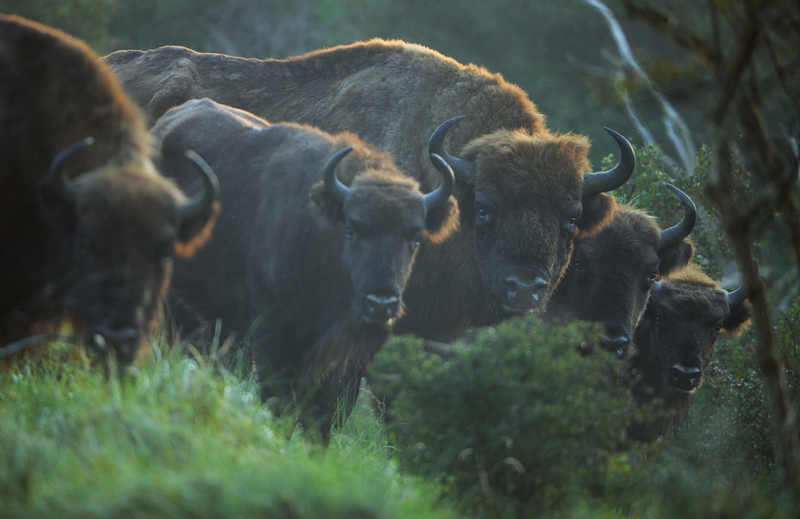 The idea to have European bison in the area was put forward by the head of the Nature Department, Piet Veel, and PWN was receptive to the idea because it would improve the specific natural values and biodiversity in the dunes. After overcoming a few obstacles, the first bison were brought in eight years ago and the herd has been growing ever since. European bison (Bison Bonasus), National Park Zuid-Kennemerland, The Netherlands. The National Park is 3,800 hectares in size, but the bison live in a 330 hectare enclosure in the south part of the park. This part was previously inaccessible to the public, but now a walking trail is open during the winter months. Some people had concerns about whether it was safe to walk through the enclosure since there is no fence along the path. However, after seeing the evidence and having their own experiences, people visiting realised that the bison are very gentle creatures and they have no reason to worry about their safety. As long as you keep your distance (over 50m), the bison do not mind people being around. They will keep an eye on you and walk away if they feel you get too close. The trail is closed in the summer but the researchers have access year-round, so Yvonne took us off the trail to explore the area. It is not all sand – the enclosure is a mixture of sandy dunes, grassy areas, areas of scrub and patches of woodland. The trees planted were mostly for forestry but are now left as they are. One of the reasons for bringing in the bison is that they are grazers and browsers. The sand dunes used to be dynamic, but in the absence of herbivores, vegetation stabilises the sand so the dunes do not longer move around. The bison have certainly started to change that! They eat grass, tree bark, they roll on the ground creating sand patches and trample the vegetation. They are not decimating their own environment but affecting it just enough to bring back some of the dynamics. We saw where the bison grazed and browsed and found the spots of their sand baths – these areas are great for lots of insects and lizards. When the bison abandon the bathing patches, pioneer plants recolonise the sand. The bison use trees as scratching posts, polishing the bark and creating a sandy area underneath. We also noticed that they had destroyed quite a few spindle trees by eating all their bark. On our hike, we noticed some fresh bison tracks in the sand and followed them up a step dune. Neither Dave nor I had ever seen a European bison before, so we were excited about finding them with Yvonne. As we came up the top of the dune, we looked down and saw the herd standing by a little lake below us. They were all looking at us whilst chewing the cud, as if they knew we were coming. They are gorgeous, gentle-looking creatures, although with dangerous looking horns! 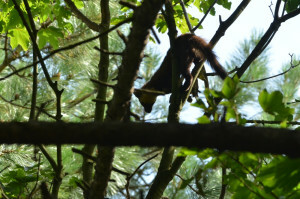 European pine marten (Martes martes), Zuid-Kennemerland National Park, The Netherlands. We spent a few days at the National Park and participated in the daily activities of researchers and volunteers. 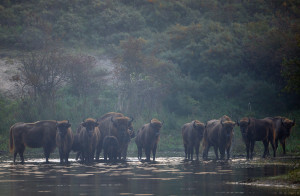 One of the current students showed us what his behavioural study of the bison involved – following the herd around for the day and constantly recording the activity of one female. When the herd moved around in the forest it was hard to keep an eye on them. Oh, and we were absolutely covered in ticks! 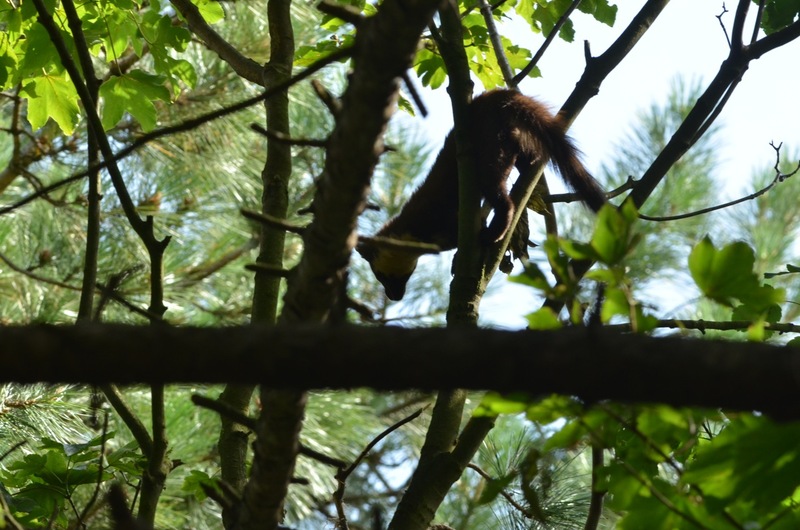 Regardless of that, it was wonderful to observe the bison and we even got lucky to spot a rare European pine marten in the trees while we were out there. During our visit, two of the young male bison were prepared for relocation. In a larger area, they would be able to leave their herd and compete over other females in neighbouring herds. However because of the size of the enclosure, they had to be transported to another area to prevent inbreeding. One of the project team members took us to visit the two male bison in the holding area that was recently constructed. We helped her guide the two bison around a narrow walkway behind the fence that would take them into the back of the truck on the moving day. Practice makes perfect! We had a fantastic visit and saw that even in a country like the Netherlands it is possible to have bison in a natural setting, a fantastic rewilding example. I hope that one day in the near future, bison will be able to roam free across European landscapes once again, and it will not be necessary to move the young males around or keep the herds in enclosures. The next place on our tour is also a bison reintroduction area in Germany where the bison are already roaming around without any fences! Keep your eyes open for the new blog about biking for rewilding, coming up soon, and also visit Anna’s and Dave’s blog www.forpeoplefornature.com. To find out more about the European Rewilding Network, its members and how you can join click here.